The Knock Out rose shot to fame and it’s star continued to shine for many years. It seems like there is not a commercial property or new home landscape that doesn't feature this rose. Even avid gardeners were finding room for a Knock Out. And why not? It was promised to be easy to grow, long-lived, ever blooming and resistant to deer, pests and diseases. And it didn't fail to hold up to its promise. But then we saw it everywhere. And seeing the same plant in every garden gets a bit tired. Instead of adding another Knock Out, what about these alternatives favored by our designers? 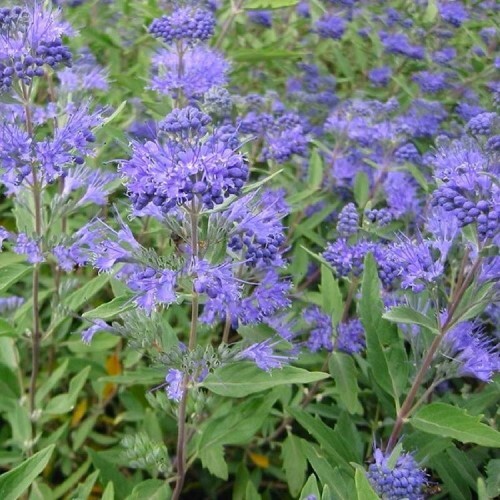 Caryopteris: Easy to grow in full sun this blooming shrub offers blue flowers from mid-summer to late fall. It’s great as a cut flower, but we want to leave the flowers as is for they attract butterflies and hummingbirds. Dwarf Crepe Myrtle: This slow growing shrub tops out at five feet. It’s compact form makes it easy to incorporate into the landscape. It prefers full sun and requires less watering once established. Twist and Shout Hydrangea: A lot of struggling roses were perhaps in full sun when they were planted, but then the garden morphed into a bit of shade. If this is the case in your landscape, Twist and Shout is a wonderful option to the rose. They bloom late spring into fall on old and new wood alike. Mix and Match: Baptisia has gorgeous blooms in the spring ranging from yellow, indigo and smokey purple. In the fall, the seed heads dry and sound like rattles. To hide their somewhat naked legs, underplant with lantanas, also available in every color imaginable. In the space once allocated to one plant, you now have two plants working together to add color and unique textures to the garden all season long. Amsonia Hubrictii Bluestar: Very few plants offer the same soft, feathery quality of amsonia with blue flowers in early spring and then finishing the season with a brilliant display of orange-yellow foliage. Instead of a plant that is unwavering in appearance from spring to fall, opt for one that transitions to give the garden a new, fresh look season-to-season.